Back in 1962 in Coventry when Pete first joined senior school he started to learn classical Violin, becoming a member of the school orchestra. Just prior to leaving school he was inducted into the Coventry Youth Orchestra. Around this time an interest was spawned in playing types of music, other than classical. Pete became involved with a couple of lads playing Irish folk music; it was at this time he met up with a Banjo player called John and a Guitar player called Ian. He began to play Fiddle in this “new” type of music called Bluegrass. Pete had already heard of the Down County Boys and had been along a number of times to see them play in Rugby. The band were looking for a new Fiddle player and after a daunting audition at Ken Harris’s house, he was offered the position of Fiddle player and jumped at the oppourtunity, joining the line up in 1970. From those early days Pete’s love of the music blossomed, greatly assisted by the other talented members of the band. They were to coach him into learning the skills of being a band member, rehearsing seriously and listening to the top American performers of that time. Over the next few years and after several personnel changes, Pete took on the responsibility of continuing the band’s progress, ensuring the stability required to keep the band rehearsing and performing. 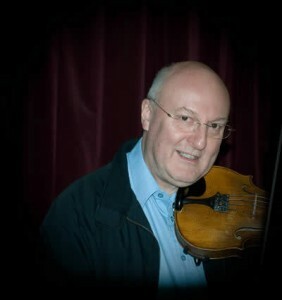 Pete draws his influences, techniques and styles from many great fiddle players, his particular favourites include, Kenny Baker, Chubby Wise, Jim VanCleve and Byron Berline, to name but a few. Playing Bluegrass fiddle over the years with the band, he has developed his own recognisable style of fiddling, now being one of the most revered players in the UK. The DCB’s always put great store in vocal arrangements and harmonies and here Pete plays a vital roll within the band’s sound, providing the baritone 3rd harmony line in most all of the arrangements. To date Pete continues to be at the helm, always encouraging and ensuring that the band performs to the best of its abilities and most importantly that the ‘band experience’ is fun and always enjoyed by the players and audience alike.